This entry was posted in Food and tagged Baking, Food, Photography by Simon Perks. Bookmark the permalink. The scones look and sound delicious! Do you have the recipe (I love savory scones)? As far as croissants go, the Tartine cookbook has a great recipe! Hi Mandy – Thanks for the tip about the Tartine cookbook. 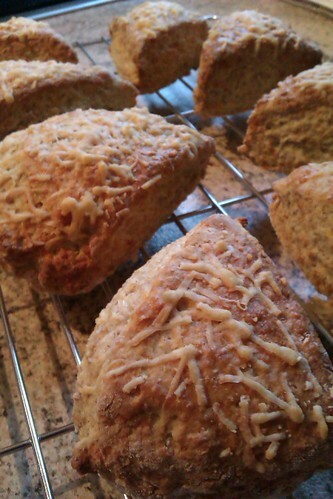 I got the scone recipe from Paul Hollywood’s baking book, but I see that it’s also online at http://www.bbc.co.uk/food/recipes/wholemeal_cheese_scones_12017 – though I made one big circle of scone mixture and chopped it into wedges, which I then spread out for baking. A much better shape for dipping into stuff! Simon.